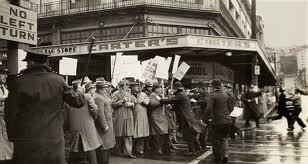 February 15, 1951 was the beginning of the waterfront lockout, followed by solidarity strikes in the rail, coal, drivers and hydro industries. Its effects are still with us. Federation of Labour would not take the side of the locked out workers, and the watersiders’ union became increasingly isolated. In April when the anti-worker legislation comes into effect the Council of Trade Unions (CTU) will hold the last of its rallies in response. This will take place under the ‘Fairness at Work’ slogan. Not only does the slogan sound conservative, the political problem with the slogan is that fairness in the workplace requires radical social change. Falling short of being able to achieve radical social change, appropriate working class slogans must be based on concrete claims that can advance the class struggle, such as freedom of association and action at work, specific wage formulations, and daring new mass demands. The use of soft phrases like ‘fairness’ can serve to limit workers’ expectations. Furthermore, ‘fairness’ is not measurable, meaning there is no political accountability for those who promote the use of the slogan. ‘partnership and productivity’ approach to unionism, which the CTU has actively constructed and engaged in, has helped to further erode working class agency. Watch this award-winning documentary ‘1951’ and see how history repeats itself. Also check out the March and April issues of The Spark which will carry a first-time published major two-part feature on the 1951 struggle.